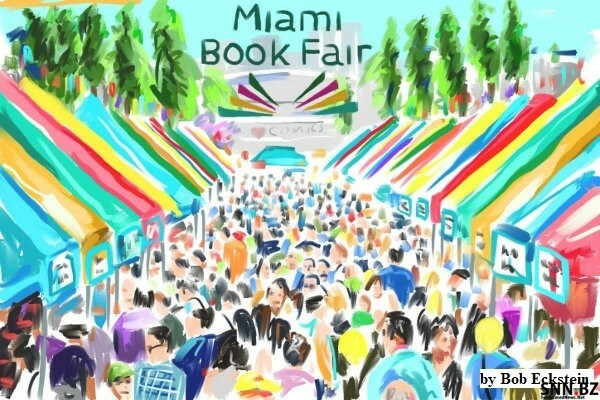 The annual Miami Book Fair held on the campus of Miami-Dade College in downtown Miami just celebrated its 35th Anniversary of hosting best-selling authors and newly published writers from all over the world. Every year, thousands of book lovers come to the week-long literary event to see informative panel discussions, entertaining presentations, and educational lectures. Hundreds of thousands of readers and writers visit the weekend outdoors part of the event to learn about the publishing industry from the hundreds of vendors who line the closed-off streets and, of course, to buy books. Stewart Stewart and I (Dena Stewart) enjoy the Miami Book Fair for all given reasons, as well as our opportunity as Media (Syndicated News Network), to have one-on-one conversations with some of the most interesting, creative, intelligent, and stimulating individuals who have had their book(s) published. One of the distinguished Authors Stewart had a sit-down conversation with at the Book Fair was Professor Alan Dershowitz who most recently published The Case Against Impeaching Trump. In The Case Against Impeaching Trump, Professor Dershowitz, a distinguished civil liberties lawyer, recently retired Law Professor at Harvard University, and a renowned political commentator, seeks to reorient the debate over impeachment to the same standard of Law that was established by the Constitution of the United States. However, at the Miami Book Fair, that was not what Stewart Stewart and Professor Dershowitz spoke about. They talked about the discord in the Country and how to remain friends with those who have different political viewpoints. Music by John McEuen, “Licensed” to SyndicatedNews.NET & TV in the US and 联合新闻.NET in Asia by “Video Wizards Music” and “Colorado Music.” By Owner/Administrator Video Wizards Music/BMI; Colorado Music / ASCAP. Music by Stephan Mikes, sole owner of all copyrights, both mechanical and SR, “Licensed” to Stewart Stewart and Dena Stewart, Center for Folk and Community Art, for use in their videos and for “Alive on South Beach”, hosted on SyndicatedNews.NET. The PRO for all works is BMI.